The 42nd Infantry Division (42ID) ("Rainbow") is a division of the United States Army National Guard. The 42nd Infantry Division has served in World War I, World War II and the Global War on Terrorism (GWOT). The division is currently headquartered at the Glenmore Road Armory in Troy, New York. The division headquarters is a unit of the New York Army National Guard. The division currently includes Army National Guard units from fourteen different states, including Connecticut, Maine, Maryland, Massachusetts, New Hampshire, New Jersey, New York, Rhode Island, and Vermont. As of 2007, 67 percent of 42ID soldiers are located in New York and New Jersey. The 42nd Division was activated in August 1917, four months after the American entry into World War I, drawing men from 26 states and the District of Columbia. It was composed of the 83rd Infantry Brigade (165th and 166th Infantry Regiments) and the 84th Infantry Brigade (167th and 168th Infantry Regiments), together with supporting units such as artillery, engineers, signals and so on. The 42nd went overseas to the Western Front of Belgium and France in November 1917, one of the first divisions of the American Expeditionary Force (AEF) to do so. The AEF was commanded by General John Joseph Pershing. Upon arrival there the 42nd Division began intensive training with the British and French armies in learning the basics of trench warfare which had, for the past three years, dominated strategy on the Western Front, with neither side advancing much further than they had in 1914. The following year, the division took part in four major operations: the Champagne-Marne, the Aisne-Marne, the Battle of Saint-Mihiel, and the Meuse-Argonne Offensive. In total, it saw 264 days of combat. While in France, the division was placed under French control for a time, commanded by various French commanders, including Henri Gouraud and Georges de Bazelaire, of the French VII Army Corps. Soldiers of the 167th Infantry Regiment man positions near St. Benoit, on the Meuse River, during the St. Mihiel offensive, September 1918. In January 1945, defending a 31-mile sector along the Rhine, north and south of Strasbourg, TF Linden repulsed a number of enemy counterattacks, at Hatten and other locations, during the German "Operation Northwind" offensive. At the headquarters of the First Battalion, 242IR, Private First Class Vito R. Bertoldo was waging his 48-hour defense of the Command Post, for which he received the Medal of Honor. When the battalion CP was attacked by a German tank with its 88-mm. gun and machine gun fire, Bertoldo remained at his post and with his own machine gun killed the occupants of the tank when they tried to remove mines which were blocking their advance. On 24 and 25 January 1945, in the Bois D’Ohlungen, and the vicinity of Schweighouse-sur-Moder and Neubourg, the 222nd Infantry Regiment held a position covering a front of 7,500 yards, three times the normal frontage for a regiment in defense. After a two-hour artillery bombardment, the 222nd Infantry Regiment was repeatedly attacked by elements of the German 7th Parachute, 47th Volks Grenadier Division, and the 25th Panzer Grenadier Division. During the ensuing struggle, one company of the 222nd IR was surrounded, but withdrew from their position and infiltrated back through the Germans to the regimental lines only after exhausting all but 35 rounds of ammunition. For 24 hours, the battle raged, but the Germans were never able to break through the 222nd IR lines. For this action the 222nd Infantry Regiment was awarded the Presidential Unit Citation (2001). After these enemy attacks, TF Linden returned to reserve of the 7th Army and trained with the remainder of the 42ID which had arrived in the meantime. 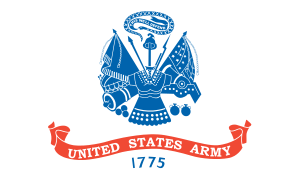 The 42nd Infantry Division absorbed the units of the 26th Infantry Division and the 50th Armored Division of the Massachusetts and New Jersey Army National Guard, respectively, in post-Cold War restructuring. All three divisions were severely understrength, so the assets of the three were combined into one. 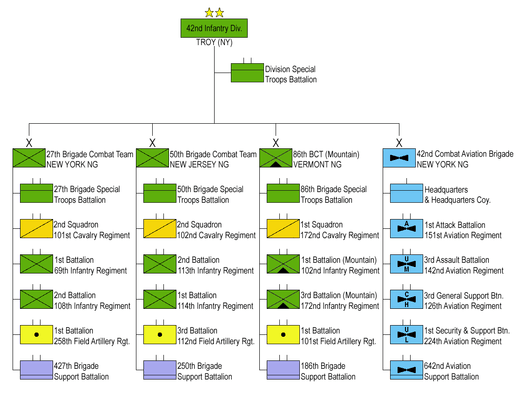 The 50th Brigade, created from the assets of the disbanding 50th Armored Division, was initially assigned to the 42nd Infantry Division as an armored brigade, but was transformed to an infantry brigade combat team (BCT) in the very first years of the 21st century as part of Army modularity. Sgt. 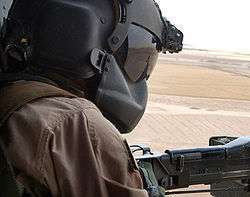 Rikki Sanchez, from the 150th General Support Aviation Battalion, 42nd Infantry Division, mans an M60D machine gun during a UH-60 Blackhawk mission in northern Iraq. 1 2 "Special Designation Listing". United States Army Center of Military History. 21 April 2010. Archived from the original on 9 June 2010. Retrieved 2010-07-14. ↑ "42nd Infantry Division History". web.archive.org. Retrieved 2014-07-28. ↑ Gilbert, Martin (1994). The First World War : a complete history. Henry Hold and Company, Inc., New York. p. 400. ISBN 0-8050-1540-X. ↑ Duffy, Bernard K.; Carpenter, Ronald H. (1997). Douglas MacArthur: Warrior as Wordsmith. Westport, CT: Greenwood Press. p. 127. ISBN 978-0-313-29148-7. ↑ Wilson, John B. (1998). "Chapter VII: The Crucible – Combat". Maneuver and Firepower: The Evolution of Divisions and Separate Brigades. Army Lineage Series. United States Army Center of Military History. CMH Pub 60-14. 1 2 Wilson, John B. (1998). "Chapter VIII: An Interlude of Peace". Maneuver and Firepower: The Evolution of Divisions and Separate Brigades. Army Lineage Series. United States Army Center of Military History. CMH Pub 60-14. ↑ "Chapter XI: A New Direction - Flexible Response". History.army.mil. Archived from the original on 17 January 2010. Retrieved 2012-12-19. ↑ "Chapter XII: Flexible Response". History.army.mil. Archived from the original on 4 June 2008. Retrieved 2012-12-19. ↑ "TIOH - Heraldry - Special Troops Battalion, 42 Infantry Division". Tioh.hqda.pentagon.mil. Retrieved 2012-12-19. ↑ "TIOH - Heraldry - Special Troops Battalion, 27 Infantry Brigade Combat Team". Tioh.hqda.pentagon.mil. 2007-08-24. Retrieved 2012-12-19. ↑ "TIOH - Heraldry - Special Troops Battalion, 86th Infantry Brigade Combat Team". Tioh.hqda.pentagon.mil. 2006-12-14. Retrieved 2012-12-19.